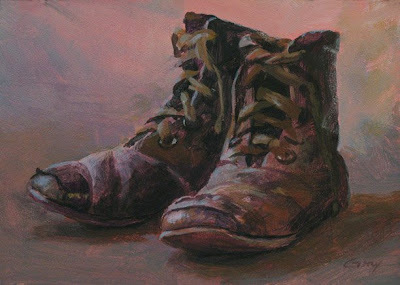 Acrylic on board, 5" x 7"
These little leather boots are about 3 1/2 inches long. I can almost picture the little boy who wore these long ago. He would have been strutting proudly, feeling he looked "just like dad." This shoe series is really wonderful! You've captured so much color. It makes these little shoes come alive. I love it. Hi Suzanne, I'm pleased you like them--thanks! Carolyn, thanks for the encouraging words!